KPA General Staff’s basic organization structure (Photo: NK Leadership Watch). The Korean People’s Army [KPA] General Staff is responsible for the military management of the service branches of the Korean People’s Army. Service branch units comprising the KPA’s integrated forces operate under the command of the KPA Chief of the General Staff. It devises strategy and issues orders and guidance to the KPA’s service branches (which include the DPRK’s conventional ground, air, naval and air defense forces). Several bureaus subordinate to the General Staff are tasked with signals intelligence collection. The General Staff also provides communications support and military education and training to the DPRK’s military. The KPA General Staff is directly subordinate to the dual control of the State Affairs Commission [SAC] and the Workers’ Party of Korea [WPK] Central Military Commission and ultimately the KPA Supreme Command. The General Staff is the primary conduit through which the KPA Supreme Command issues orders and guidance, as well as interacts, with KPA service branch commanders. 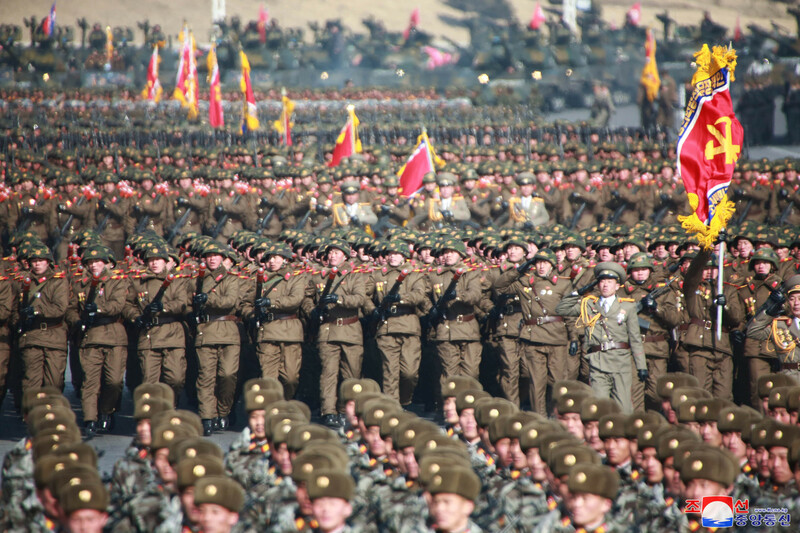 In a general context, military policy, strategy, planning and guidance issued by the KPA General Staff must be obeyed by the other components (the KPA General Political Department, the Ministry of the People’s Armed Forces, the Military Security Command) that comprise North Korea’s armed forces. The General Staff, however, does not involve itself in political and security management. Vice Chiefs of the KPA General Staff sometimes hold these positions concurrent to other leadership positions in the military (i.e. 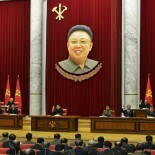 head of the KPA Reconnaissance General Bureau, Artillery Command, etc). Others provide operational and administrative support to the General Staff and conduct inspections of military units. This latter cohort sometimes form a personnel bench in which they are then assigned to another position in the high command or are rotated out into field command. The KPA General Staff has nearly 30 subordinate bureaus and commands. In the General Staff apparatus are the country’s naval command (the Korean People’s Navy) and air command (the Korean People’s Air and Anti-Air Force), as well as the KPA’s Ground Forces. In addition to these three conventional service branches are the KPA’s special operations forces [SOF] which are organized under the XI Army Corps (the Storm Corps) and the KPA General Staff Light Infantry Training Guidance Bureau. The KPA’s SOF, like elements of its three conventional service branches, link with or seconded to the KPA Reconnaissance General Bureau. The General Staff Operations Bureau directs the KPA’s operational planning including ground, naval and air commands and links military commanders to the KPA Supreme Command staff. The Operations Bureau also provides general guidance and management over KPA training and other military exercises. The KPA General Staff Communications Bureau maintains the telecommunications and signals infrastructure of the military and is involved with foreign and domestic signals intelligence collection. The Electronic Warfare Bureau manages electronic and electronic information warfare, in operational coordination with the Communications Bureau and the Reconnaissance General Bureau. The KPA General Staff Classified Information Bureau is responsible for the production, dissemination, storage and maintenance of the hardware and software of classified information (planning and operations documents, reports to superior officers and/or departments, intelligence products) within the KPA General Staff apparatus. The Classified Information Bureau links with the KPA General Staff Communications Bureau and elements of the Military Security Command. 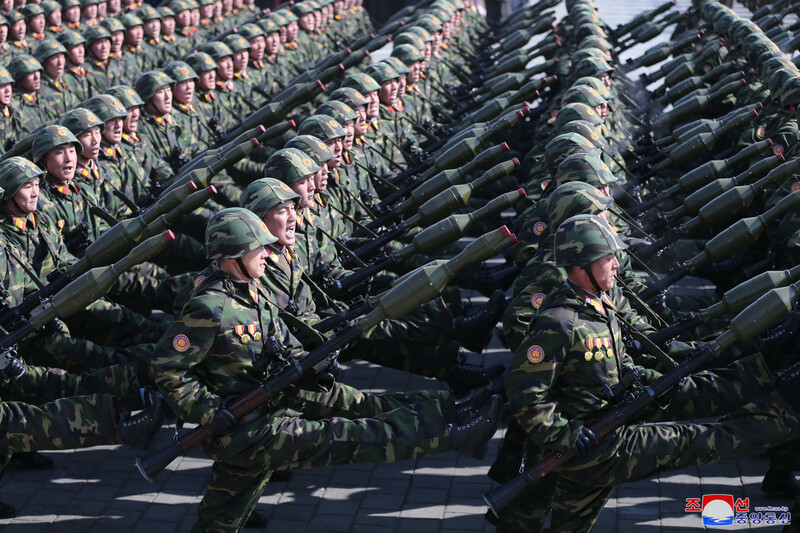 The General Staff Training Bureau and the General Staff Publication Bureau are responsible for administration and management of the DPRK’s military training, including military universities, officers’ and command schools. The President of Kim Il Sung Military University (Academy) has traditionally held a concurrent Vice Chief of the KPA General Staff position. The Training Bureau also manages a group of military studies institutes that research and analyze strategy, doctrine, operational art and military history. The KPA General Staff also has a Foreign Currency Exchange Bureau which owns several clothing and consumer goods factories and other production units (mines, farms) and is involved in exporting materials and products outside the DPRK to earn foreign currency. The Foreign Currency Exchange Bureau, while active at or near KPA bases throughout the country, has a significant presence in the north-central city of Manp’o on the DPRK-PRC border. The KPA General Political Department’s Organization Bureau, at the central (national) and regional levels, is responsible for monitoring and conducting financial audits of the General Staff Foreign Currency Exchange Bureau and its sister organization in the MPAF, the 44th Bureau. In addition to these, other support bureaus include: the KPA General Staff Engineering Bureau (which plans and controls combat engineering units); the KPA General Staff Technology Bureau (which is responsible for computers, tablets and other IT needs and coordinated with the Communication Bureau); the KPA General Staff Construction Bureau (which links with the KPA General Logistical Department and has a mission for construction projects and property maintenance at KPA units); the KPA General Staff Ordnance Bureau (which links with the MPAF and the WPK Munitions Industry Department); the KPA General Staff Labor Administration Bureau (which links with the KPA General Logistics Department and the KPA General Political Department); the KPA General Staff Transportation Bureau; and, the KPA General Staff Mapping and Topography Bureau. The KPA General Staff Department is technically subordinate to the joint command and control of the SAC (state) and CMC (party). It sits in an organizational trio, with the KPA General Political Department (political management and political commissar corps) and Ministry of People’s Armed Forces [MPAF] (military administration, logistics and rear services), that comprises North Korea’s armed forces. Since the 1970s, the KPA General Political Department, which exercises the WPK’s (the party’s) control over the DPRK’s armed forces, assumes precedence over the General Staff and MPAF. 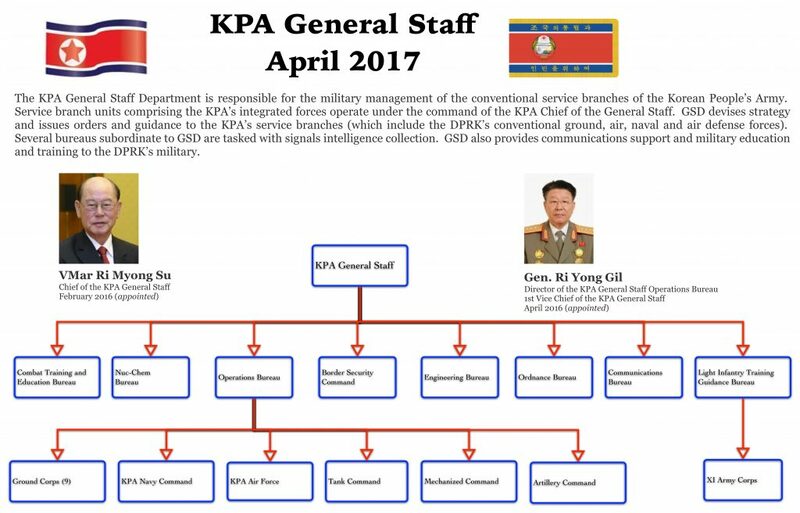 The KPA General Staff Operations Bureau [GSOB] links with the KPA Supreme Command and, one of the GSOB’s subordinate organizations (the so-called #2 Department) contains members of the KPA Supreme Command staff. Vice Marshal Ri Myong Su [Ri Myo’ng-su] has served as Chief of the KPA General Staff since February 2016. VMar Ri was a close adjutant of late DPRK leader Kim Jong Il [Kim Cho’ng-il], served as Director of the KPA General Staff Operation Bureau from 1996 to 2007 and his military career goes all the way back to the Korean (Fatherland Liberation) War. Ri is also a member of the WPK Political Bureau and the WPK Central Military Commission. Gen. Ri Yong Gil [Ri Yo’ng-kil] serves as Director of the KPA General Staff Operations Bureau and 1st Vice Chief of the KPA General Staff. Gen. Ri is also the immediate past Chief of the KPA General Staff.